Biting into a perfectly crispy fried shrimp is so satisfying. The 10 grams of fat per serving? Not so satisfying. This dish has all the crunch, with much less fat. Biting into a perfectly crispy fried shrimp is so satisfying. The 10 grams of fat per serving? Not so satisfying. This dish has all the crunch, with much less fat. Edamame are young soybeans. Find them in the frozen food section shelled or still in their fuzzy pods. If you can't find them shelled, thaw them and shuck them as you would peas or beans. Wasabi is Japanese horseradish. Find it in paste or powder form in the Asian section of most supermarkets. Use it sparingly--it's potent. Here, we've softened the bite with sweet edamame and fresh spinach. When breading the shrimp try to use only one hand for the wet ingredients and one hand for the dry. You will avoid lumps in the breading. This sauce is reminiscent of cocktail sauce with the tangy wasabi. Turn this into a light meal by serving the shrimp with a green salad. Preheat the oven to 400 degrees. Place a cooling rack on top of a sheet pan and set both in the oven to preheat. Set up a breading station: Place the flour and paprika in one flat-bottomed dish, the egg whites in a second and the panko in a resealable bag. Remove the pan and rack from the oven and coat with nonstick cooking spray. Bread the shrimp: Place them in the flour and coat well, then use your other hand to place them in the egg whites. Finally place the shrimp into the bag of panko and shake well. Place the shrimp on the rack. Repeat with the remaining shrimp, making sure you use one hand for the wet and one hand for the dry ingredients to avoid clumps. 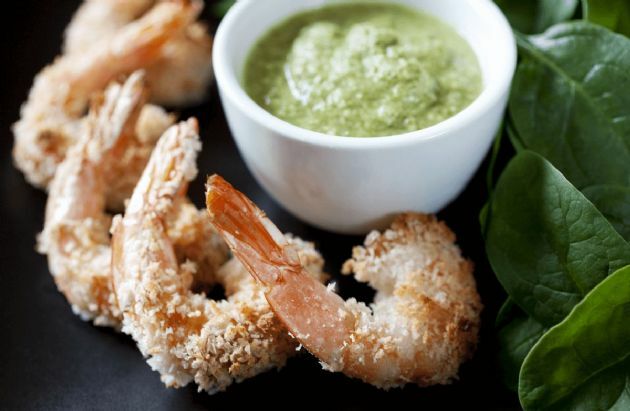 Once all the shrimp have been breaded, coat them with nonstick cooking spray. Bake 12-14 minutes, until the crust is slightly browned. While the shrimp is baking, prepare the sauce. Simmer the edamame in 2 cups of water for 10 minutes, then add the spinach and cook another minute. Drain the water, reserving one cup. Run cold water over the edamame and spinach to shock them (this stops the cooking process and retains the color of the spinach). Note: You will only use about half the flour, but you need that much to ensure even coating.